There are four types of ice to consider here typical cubes, gourmet ice, shaved ice and sonic ice. Sonic ice is also commonly known as the nugget or pellet ice because of the little pellet shapes. They each have their pros and cons when making these drinks. Traditional cubes are great for frozen alcoholic drinks because they don’t water down the drinks so fast. The last thing that drinker want is a diluted margarita. However, these larger forms aren’t that popular with drinkers. They are large, hard to crunch on and not that convenient for drinks machines. Shaved ice or gourmet ice are rarer, and their use depends on the drink and setting. High-end restaurants may use gourmet ice for the shape and clarity, but it doesn’t add much to the drink. Many drinks machines will use the blade to shave the ice for a better process. But, not all drinkers are happy with the texture, and it melts far too fast. The host may want one type of ice for “Margaritas on the Rocks” and the other type of frozen margaritas. Drinkers love the way that it soaks up the flavors of the drink and is chewable for a refreshing experience. This is ideal for soft drinks like soda or juices, but not for the frozen margarita, better for a margarita on the rocks. Often, it will all come down to taste and the means of production. Those creating margaritas for pitchers can use any ice they choose from their ice machine. Those using specialized Margarita machines need ice that is suitable for that design. In fact, the official Margaritaville blog has its own views on the best way to make ice for a margarita. That said, it does seem to shy away from the nugget vs. sonic ice debate, perhaps not wanting to alienate half their audience. They do, however, offer this advice. Use boiled, filtered water to be sure of clear, top quality ice cubes and pellet. This will remove impurities, improve the look of the ice and impress guests further. This advice is important for any form of ice production. The host should decide whether the margaritas will be frozen or served on the rocks or both. A reliable ice machine is essential for those that don’t have specialized Margarita machines or other drinks makers. You can create a pitcher of drink while the machine churns out a regular supply of ice. There is a choice here between portable models, counter-top models and built-in ice machines for the kitchen more details on IceMakersHub. The portable machines are a great idea for parties and outdoor areas. Especially true if there is an electrical outlet in the patio area, meaning that hosts and guests can refill the water reservoir and pitchers without having to go inside. This is perfect for hosts that want to contain the party outside. It is also easier to see when it needs replenishing. The problem is that these small machines don’t always have the features and capacity of other models. A counter-top ice machine is larger, and users can also store it away after the party. But, they are best used in the kitchen. Other homeowners will prefer the idea of those built-in ice machines for the kitchen. This isn’t as convenient for parties, but it can be a great investment for long-term use. They provide a regular supply of ice for any occasion from a neat, concealed unit indoors. They aren’t great for large parties, but they can help when friends stop by unannounced for a cocktail. Most people do not have time to do what a mixologist does. Therefore, all consumers should look at the capacity and ease of use of an ice machine, regardless of the style of ice. The capacity determines how much ice you can make before refilling the machine. The smaller the capacity, the more likely it is that guests won’t be able to replenish their glasses or pitchers. It is all about creating a steady flow. Some portable machines might be a little small. Then there is the ease of use in the buttons and settings. If you call over to a friend to help out and refill it, could they figure it out? Or, is all the responsibility for ice falling square upon your shoulders? Of course, Jimmy Buffett himself would prefer we all stay loyal to official Margaritaville machines. This is regardless of their higher cost. There are some impressive machines in the range that combine the blender and ice reservoir for a simple, effective approach. Many Parrotheads will be after the new Jimmy Buffett Anniversary Edition Key West machine. This large model supposedly holds enough ice and drink for 3 pitchers. This should appease the crowd for a while. It also has an easy pour jug, a choice of 3 drinks and pre-programmed cycles for ease of use. 5. The Best Parties Need A Margarita Recipe Or Two – or maybe Three! If you are new to creating your own Margaritas, or to Margaritaville parties, this first option is a great starting point. This classic Margarita recipe is an old favorite and comes straight from the Margaritaville website. 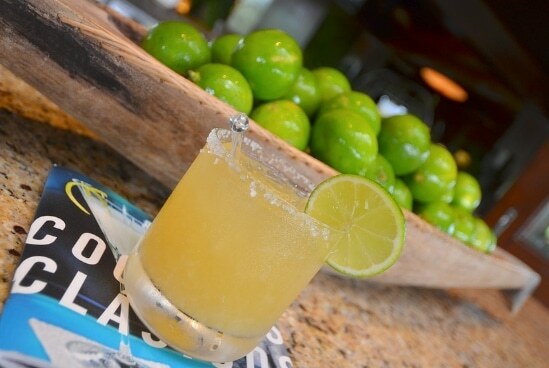 It starts off with 4 and a half ounces of Margaritaville® tequila – the good stuff. From there, add in 1 and a half ounces lime juice, 3 ounces of strawberry daiquiri mix and a “splash” of strawberry liqueur. Add 3 ounces of frozen strawberries for texture and fruitiness. Make sure to pour it into sugar-rimmed glasses and then garnish it with a fresh strawberry. Alternatively, you might want to try out the Traditional Key West Margarita. This can make it feel like you’re in Margaritaville. Perhaps it will help when relieving memories of a summer holiday in the Key West Margaritaville resort. Start with 3 ounces of that Margaritaville® tequila. Mix it with 1 and a half ounces of both citrus liqueur and jalapeno tequila, as well as 3 ounces of lime juice. A pinch chipotle chili powder and some jalapenos and limes add to the southern fire. Don’t forget the ice and the salt-rimmed glasses. It is all about creating a high-end drink that becomes your specialty. This may have you playing bartender all night, but it means that guests enjoy your creation. Still, there will be guests that fancy a few different choices of drink, with variations on a theme. If you have lots of guests with different tastes, it might be worth investing in a Margarita maker and loading it up with a series of recipes. You need a good ice machine to handle the volume. For more drink recipes click here. Parties with a large number of guests mean a regular supply of margaritas and other drinks. It can be difficult to keep up with made-to-order margaritas when playing host – that is unless you can hire a bartender for the night. The alternative is to create pitchers with larger quantities of margarita. Here you can add ice as required and let guests pour their own beverage. This should keep the flow of drinks a little more steady. The next question is what type of ice should you use in your margarita. There will be guests at the party that want to join in on the fun, but don’t want any alcohol. Whether this is down to their role as designated driver, or a personal lifestyle choice, respect that decision. Make sure that you provide non-alcoholic alternatives. That means something more exciting than orange juice and diet soda. If you are going to take the time to perfect cocktails, you can also learn to make some mocktails. A great starting point is a mock margarita. This way drinkers can enjoy the same tastes and drinking experience, just minus the booze. This recipe uses frozen strawberries, lemonade concentrate, water and agave nectar to replicate the look and taste. From there, the user can fill the concoction with ice as needed. Make sure to serve it in a salted-rimmed glass for the full effect. Another popular option is the Virgin sangria. The sangria uses all the same fruits and fruit juice, with a little-iced tea and club soda. There are some hosts that will try and make this an adults-only affair. They may want to reminisce about past holidays, sharing memories best kept for an over-21 audience. Others will look to ensure that it is a more family-friendly affair. The kids need something to drink too. The option of virgin cocktails is up to the parents. Make sure to provide plenty of soft drinks as a safe option – maybe even a slushie maker besides the margarita maker. This is where that sonic ice will come to good use because kids just love crunching ice. These icy margaritas may be the star here, but they are no good on their own. Guests are going to need some good grub to keep them happy and soak up the cocktails. An easy option is to get the grill out for some cheeseburgers in paradise, as well as other classic treats. This is simple food that is easy to eat and prepare. As long as there are enough patties, bun and cheese slices, you should be fine. Still, you need to try and remember to add some fish and vegetarian options for those that don’t eat meat. The alternative to these cheeseburgers is going for some southern flavors to complement the margaritas. Again, Cinco de Mayo may have been and gone, but we don’t need much excuse to celebrate Mexican cuisine. Staple Mexican platters and nachos always go down well. Fajitas are great party food for the masses. Hosts with some cookery skills can also make their own dishes, guacamole, and other sides. People will want to hear Jimmy Buffett if they are specifically attending a Buffett-themed Margaritaville party. Obviously, you can mix things up a bit and create a related playlist, but the main man has to be there somewhere. A portable CD player offers an old-fashioned charm if you can cue up the albums. A portable PA system and iPod dock are a little more convenient for an infinite selection. Top streaming sites should have Jimmy’s back catalog and may even create a recommended playlist. Follow these 10 steps, get organized, plan ahead and your party is sure to be a success! Cheers! Just remember, preparation is important to get the best out of your next Jimmy Buffett party. Practice the margaritas and figure out the best use of ice. If you want shaved or sonic ice, make sure that you have a machine that can provide it in the right quantities. Alternatively, invest in the right Margaritaville machine. Finally, don’t forget to cater to all your guests, regardless of age or taste. This is a celebration where everyone should be able to relax with a good glass of a frozen cocktail, a tasty burger, and Jimmy on the stereo.